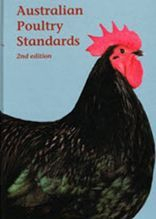 South Australian Poultry Association Inc.
Fees cover South Australian Poultry Association Inc. registration, 2019 Handbook, 3 copies of ‘Poultry News’ and eligibility for SAPA Most Successful Exhibitor of the Year Awards for Large Fowl, Bantam, Waterfowl and Junior. Agricultural Show societies may affiliate with SAPA for a fee of $15.00. 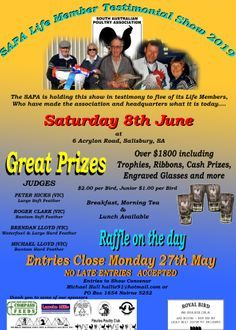 Payment of this fee will entitle the affiliated society to a SAPA 2019 Handbook and a Champion Bird of Show Ribbon, provided that at least one Judge is selected from the SAPA Judges Panel. 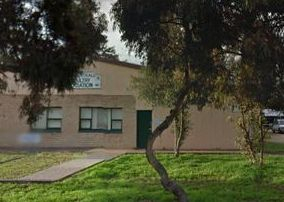 The South Australian Poultry Association is located at 6 Acrylon Road Salisbury.The building has penning for approximately 1500 birds under cover. There is a meeting room that contains a kitchen area including a wall oven and refrigerator. Hot water is provided. This room is heated with bar heaters. This is also an eating area that is screened from the exhibition area. Thanks to dedicated members of S.A.P.A. the upgrade of these facilities have been completed. The facility is available for hire and would be most suitable for groups that exhibit pigeons, cage birds etc. Inspection is welcome and long-term hire agreements can be negotiated.